Latanoprost is a prostaglandin F2α analogue. Latanoprost is a colorless to slightly yellow oil that is very soluble in acetonitrile and freely soluble in acetone, ethanol, ethyl acetate, isopropanol, methanol and octanol. It is practically insoluble in water. 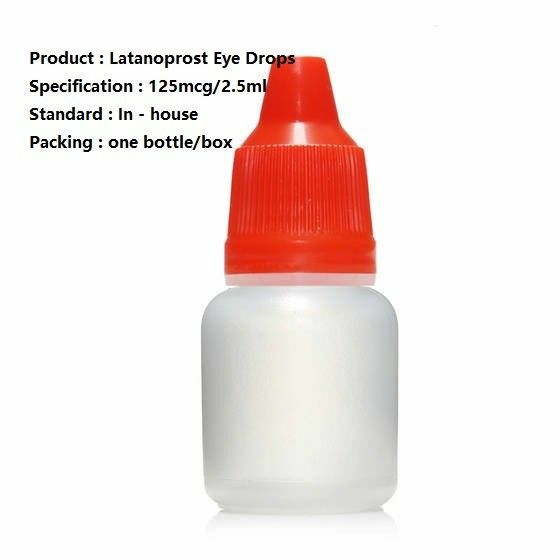 Latanoprost ophthalmic solution is supplied as a sterile, isotonic, buffered aqueous solution of latanoprost with a pH of approximately 6.7 and an osmolality of approximately 267 mOsmol/kg. Each mL of latanoprost ophthalmic solution contains 50 micrograms of latanoprost. Benzalkonium chloride, 0.02% is added as a preservative. The inactive ingredients are: sodium chloride, sodium phosphate dibasic (anhydrous), sodium phosphate monobasic monohydrate and water for injection. One drop contains approximately 1.5 mcg of latanoprost. Reduction of elevated intraocular pressure in patients with open angle glaucoma and ocular hypertension. Reduction of elevated intraocular pressure in paediatric patients with elevated intraocular pressure and paediatric glaucoma. Recommended therapy is one eye drop in the affected eye(s) once daily. Optimal effect is obtained if Latanoprost is administered in the evening. The dosage of Latanoprost should not exceed once daily since it has been shown that more frequent administration decreases the intraocular pressure lowering effect. If one dose is missed, treatment should continue with the next dose as normal. As with any eye drops, to reduce possible systemic absorption, it is recommended that the lachrymal sac be compressed at the medial canthus (punctal occlusion) for one minute. This should be performed immediately following the instillation of each drop. Contact lenses should be removed before instillation of the eye drops and may be reinserted after 15 minutes. If more than one topical ophthalmic medicinal product is being used, the medicinal products should be administered at least five minutes apart. Latanoprost may be used in paediatric patients at the same posology as in adults. No data are available for preterm infants (less than 36 weeks gestational age). Data in age group < 1 year (4 patients) are limited. Latanoprost is a prostaglandin F2a analogue. Specifically, Latanoprost is a prostanoid selective FP receptor agonist that is believed to reduce the intraocular pressure (IOP) by increasing the outflow of aqueous humor. Studies in animals and man suggest that the main mechanism of action is increased uveoscleral.